Based on the WebKit rendering engine, the Opera 15 final version was released earlier this week. This is the first desktop browser from Opera Software rely on the engine open source Chromium rendering. The Norwegian publisher count also discontinue support for version 12. Monday, Opera Software has delivered the final version of Opera 15 for both Windows and OS X. The software was available in beta since the end of May. The Norwegian publisher also preparing a Linux version "for the foreseeable future." Opera recognizes that users will have to get used to the changes. In a blog post, Mark Wilton-Jones, the service quality of the group, said: "With this release, we make a fresh start especially in monitoring and resolving security issues." This means that "security updates previous editions of Opera will soon end," he added. 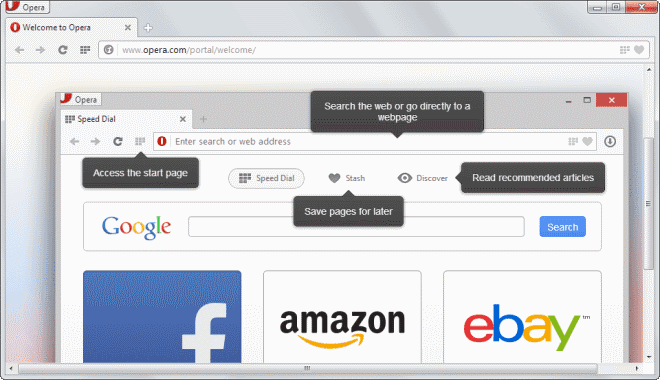 "Opera 12.16 is the last update of security that we deliver to the browser based on Opera Desktop Presto. Users are advised to switch to Opera 15 ... as soon as possible, "he also wrote. Safety patch 12.16 who has not yet been delivered, will succeed the current version 12.15. On the blog of Mark Wilson-Jones, several commentators have questioned whether this would actually say that the 12.16 version would be the last update of security would benefit the product. In another blog, Sebastian Baberowski, member of the team to develop the desktop Opera browser, has hinted that the publisher would continue to support version 12 some time. "We have neither sought nor forced users 12.x versions to go to Opera 15," he wrote. "We will continue to update Opera 12.x and deliver security patches for this series. Later, when we will harness all of Opera 15 features, we may have to ask them to upgrade. "For now, Opera Software has not responded to a request for comment to clarify these contradictory statements. More than 300 users have left comments on the blog of Sebastian Baberowski, most to express their dissatisfaction with the release of Opera 15 and the demise of Opera 12. They also complain of missing Opera 12 features and strongly criticized the abandonment by the publisher of years spent working for the engine home. "If Opera 15 remains as it is today, is going to happen to what happened with Flickr in May. Ugly and unpleasant to use, users implicitly sends the message that they like and what they need does not matter, "wrote one commentator blog identified by the nickname" 0paulh177. " Opera has loyal users, but the browser has never been able to get to the top in the battle of Desktop Web browsers.